Had fun today with the fire ring behind the coach. We’ve usually had these rings when we park in a campground, but you’ve heard me make fun of our “camping” interests. You know, how we sit inside the coach when it’s warm….with the air conditioning running and eating ice cream….watching other campers sit around their campfires….while we run our electric fireplace. We finally hit a sweet spot today. Temps in low 50s, light but steady breeze blowing from coach toward fire ring, and plenty of firewood nearby in the form of old storm damaged limbs stacked along the campsites. I used my faithful Pathfinder fire starter (nooooo, not white gas, the propane torch) and had nice coals in no time. Then Robyn piled on that gigantic chunk of wood. 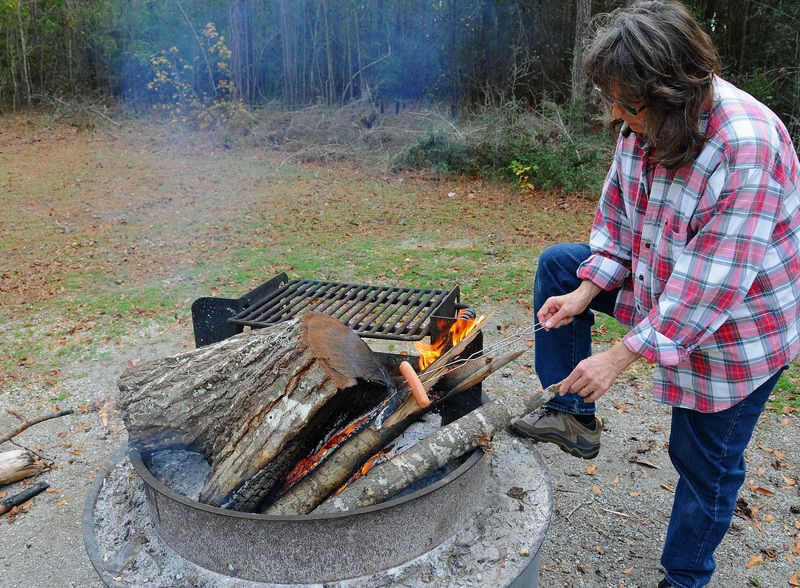 She, the seasoned camp cook, got right to work toasting cinnamon swirl raisin bread and hot dogs, and putting in potatoes to bake. We ate like kings. Listened to huge “boom” sounds all day from nearby Camp Lejeune. Couldn’t tell if the Marines were exploding bombs or firing huge artillery. Have my field jacket hanging outside all night to get rid of the campfire smoke…. It’s about time you guys roughed it a bit! LOL! Yeah, you’re right, but this is as close as I want to get! We really are a contradiction in terms: this huge, sophisticated rig parked out in the boonies! We love the natural surroundings, but need all the modern tools for homemaking. With these boys, we’d have never made it as pioneers!